Last week, my brother presented me with a notebook having a problem I’ve never encountered before. 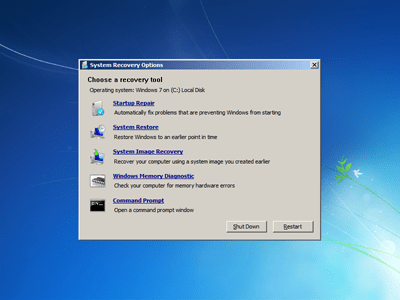 What happens to the computer is it boots into the recovery prompt of windows 7 and tries using that to fix a ‘startup problem’ which it isn’t able to do so. In this condition, the user will not be able to go into the windows environment at all. At first I tried recreating the condition via the install disc in the hopes that the ‘real’ recovery system will take over the persistent one and then skip it altogether, no dice. I then proceeded to tinkering with the available recovery options that were being presented and was not able to find any system restore images (it might be there but the recovery refuses to see it, or there was actually none to work with)… there was also the possibility to get into the command prompt but various suggested commands to fix the master boot record yielded the same loop again. Eventually we had to go with reformatting the drive entirely, the origin of the problem, according to research, is a BSOD or a sudden reboot which the cause is also undocumented. It is one of the most problematic states that the operating system gets into so remember to always have backups pr separate partitions to host your data in… you’ll never know when you might encounter the same.